We were about to leave the park when I saw these two people sitting and admiring the view. I smiled at my husband and snapped this photo. I nodded and said, "I know how they feel." 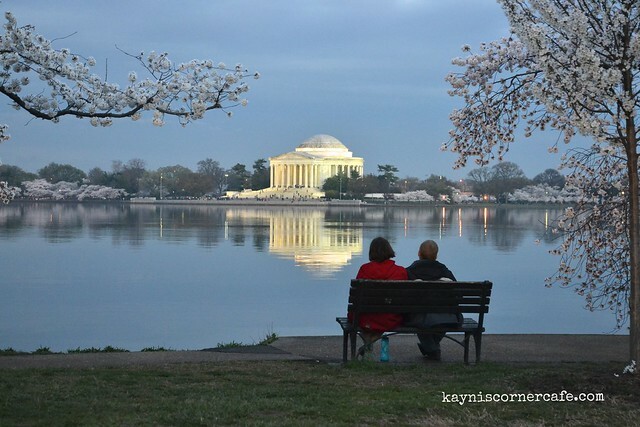 The best way to enjoy the Cherry Blossoms is to pick a spot and be still. Once you're still, you'll feel their breathing, appreciate their beauty and admire their grace. A beautiful shot. Perfectly framed and wonderfully captured moment in time! This is a postcard shot; You can even make greeting card from this. How wonderfully captured. Beautiful scene, both across the water and up close. Wow - what a magical scene. No wonder at all. I would join them if I was there. there's just something very calm and soothing in this picture. The photo tells a story. I like how you exchanged gratitude to your husband before you snapped the shot. That is a truly evocative photo. You can almost feel the stillness. Impressive image Kayni! Very sharp and beautiful :) I would love to be there! Great capture of this special moment in this scenery. You ask me about the snow in Swedish Lappland. I'm home in germany now, but I guess there is still snow.